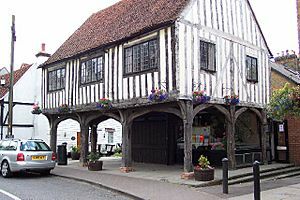 This page is about the English borough. For the Parliament constituency, see Thurrock (UK Parliament constituency). 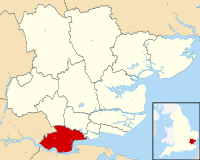 Thurrock /ˈθʌrək/ is a unitary authority area with borough status in the English ceremonial county of Essex. 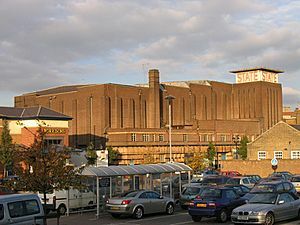 It is part of the London commuter belt and an area of regeneration within the Thames Gateway redevelopment zone. The local authority is Thurrock Council. It lies on the River Thames just to the east of London. With over 18 miles (29 km) of riverfront it covers an area of 64 square miles (166 km²), with more than half defined as Green Belt. With Greater London to the west and the river to the south, the county of Essex abuts the Borough to the north and east, and across the river lies Kent. The Council is led by Cllr Rob Gledhill (C) as of May 2016. The Mayor is Cllr Cathy Kent (L). At the census of 2011, there were 157,705 people, 62,353 households and 45,985 families residing in the borough. The population density was 9.7 people per hectare. There were 63,869 housing units. The racial makeup of the borough was 91.0% White, 3.3% South Asian, 3.2% Black, 1.5% Mixed Race, 1.0% Chinese or other. Climate in this area has mild differences between highs and lows, and there is adequate rainfall year round. The Köppen Climate Classification subtype for this climate is "Cfb" (Marine West Coast Climate/Oceanic climate). Thurrock Facts for Kids. Kiddle Encyclopedia.